The photomacrographic corner square scale is designed in the style of the 'ABFO' scale to compensate for distortion resulting from oblique camera angles. DfS has redesigned the booklet to include smaller numbers and arrows when more definitive orientation is necessary OR to detail stains used in pattern reconstruction. THE PRICE REMAINS THE SAME! These 2" x 50mm scales are printed on flat white, gray or black pressure sensitive paper with a peel-away backing. Photo evidence scales are now available in a convenient assortment booklet! Excellent scale for comparison photography. this rigid scale may be placed evenly in the same plane in two-dimensional or three-dimensional impressions. The same as the rigid Bureau Scale - except that it folds for easy storage. Excellent photomacrographic scale for comparison photography. These metric scales are constructed of matte white, non-reflective rigid plastic. Pack of 10 - 5cm or 10cm. Disposable 6mm Metric Scales - 500 pieces. Easy to see in photography. Now you can compensate for distortion resulting from oblique camera angles with a disposable photomacrographic scale designed to eliminate the possibility of cross contamination in biohazardous conditions. These disposable scales have a photographic yellow background with bold black printi for effective orientation and documentation. 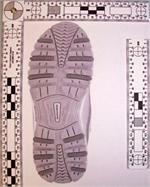 Excellent tool for mapping of crime scene, blood stains and reconstruction purposes. Due to demand, DfS now offers the same ABFO #2 type scale in yellow. These scales are of the highest quality. 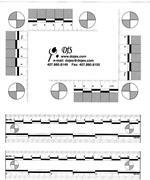 Photo Evidence Ruler Assortment (10 pack) Pack Consists of 4-Gray w/Black Print, 3-Yellow w/Black Print and 3-White w/Black Print. Durable Plastic Rulers. The Pocket Rod is available in inches or metric units, looks like the average retractable tape measure in size and appearance..but IT'S NOT! These scales are 12" long, made of bright yellow plastic with black numbering. They have horizontal and vertical markings on opposite sides. On the vertical side, numbers are printed from top to bottom. .